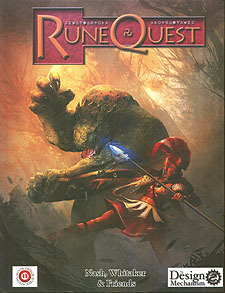 RuneQuest is one of the seminal fantasy roleplaying games with over 30 years of history. Now in a brand-new edition everything you need for exciting adventure in fantastic worlds is presented in one volume. A cunning warrior? A wily thief? A powerful sorcerer? An agent of the Gods? In RuneQuest you define your character. Its skill-based system allows for infinite combinations of talents and capabilities. Are you a nomad of the steppes, following the herd-trails? Perhaps you are a hardened barbarian used to the raids of your neighbours and the whims of the Gods. Maybe you are a city-dweller, used to the comforts and amenities of civilization. In RuneQuest where you come from is as important as who you are. Do you worship the mighty Gods of Sun, Storm and War? Are you, perhaps, a follower of the Great Ancestor Spirits? Or is it that you shun the Gods and follow a more mystical path, seeking enlightenment and perfection? Maybe you prefer the dark and dire potency of sorcery! In RuneQuest your beliefs shape your magic and your destiny, and through them access to the cosmic powers of the Runes themselves. RuneQuest supports every kind of fantasy, from gritty Swords and Sorcery through to heroic fantasy adventure filled with magic and intrigue. Its blend of rules and mechanics are flexible and adaptable. With RuneQuest you can create the settings and stories that suit your style of play. Everything You Need in One Book.